View of the commemorative obelisk in Barnet, Hertfordshire. 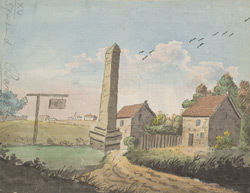 The obelisk was built by Sir Jeremy Sambrook in 1471 in Hadley Green and is known as the Hadley Highstone. It commemorates the Battle of Barnet which took place here in 1471 between King Edward IV and the Earl of Warwick, who was known as ‘The Kingmaker’. The Battle of Barnet was one of a number of battles which collectively, are known as the Wars of the Roses in which the houses of Lancaster and York fought for control of the crown of England. Warwick was killed on the field and this column was built on the spot where it was thought that he died.